The Gentle Leader Head Collar is a wonderful training tool and traditional collar alternative for many types of dogs. 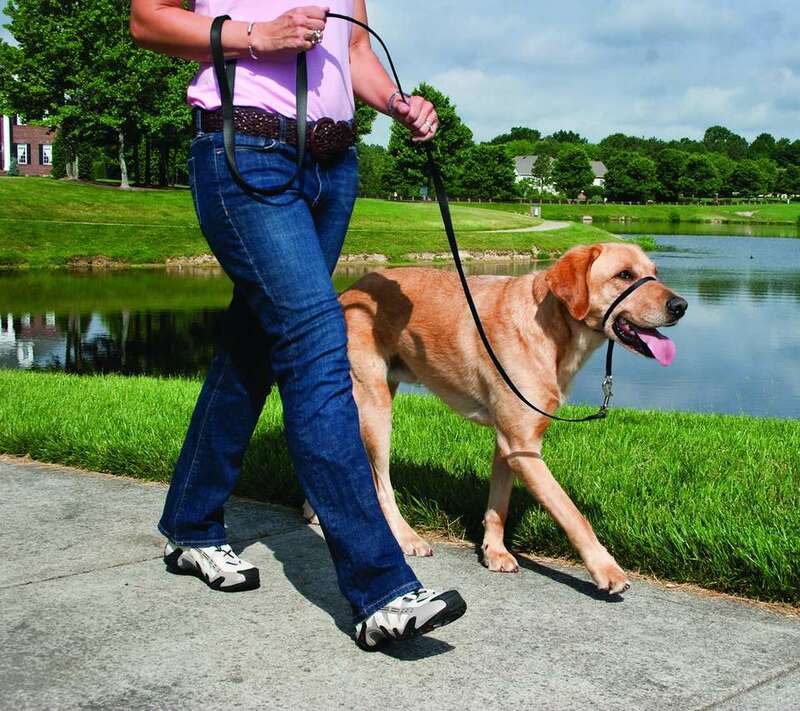 Its design prevents dogs from pulling on the leash, jumping up, and lunging. This head halter can help owners train their dogs to walk properly on the leash. I first heard about the Gentle Leader Head Collar many years ago and have seen it work for many dogs in the past. I was recently able to test it out on a dog with a tendency to leash-pull and a habit of jumping up. To some, the Gentle Leader looks like a muzzle, but it is not. The nylon material wraps over the nose and back of the neck. When your dog pulls on the leash, the Gentle Leader causes the head to turn back towards you. When the dog's head is turned, he no longer moves in the original direction and stops pulling. A dog wearing the head collar can still eat, drink, pant, bark and carry toys. It is lightweight and should not cause pain, coughing, choking, or gagging. Be aware that the product may not work as well on very short-nosed dog breeds. Though some dogs may try to back out of the head collar or paw at it, the Gentle Leader (unlike some other head collars) remains secure around the back of the head if fitted properly. The Gentle Leader comes with a detailed instruction booklet as well as an informative DVD. It is essential to follow instructions for use of this product, especially those for fitting and acclimation techniques. Following the directions exactly makes success highly likely. After proper fitting, I began using the Gentle Leader on my dog. She seemed mildly confused and tried to rub the head collar off of her face. After spending a few minutes on the instructed acclimation procedures, we were ready for a walk. To my delight, my dog walked quite well. Each time she tried to pull or jump up, the light resistance on the head collar caused her to stop. After several walks, she had stopped pulling and jumping almost completely. She still occasionally paws at her face, but this is improving over time. Though it may take some time and training for you and your dog to get used to the Gentle Leader, it is worth the effort. With some dedication, you can expect to see truly positive results.